A Female Riot. — About 100 Women from the North-Part of the Town, getting information of a Quanty. of Coffee being in the Store of Thos. Boylston, Esqr. which he refused to sell at the regulated Price, attacked him in King-Street, and demanded the Keys of his Store, which he refusing to deliver, they immediately placed him in a Cart, and threatened to Cart him out of Town, upon which he delivered them the Keys. — A Committee was appointed to keep him Custody while the Body was employed in getting the Coffee out of the Store, which they speedily effected, and went off with their booty. This incident is better known from a letter written by Abigail Adams a week later. 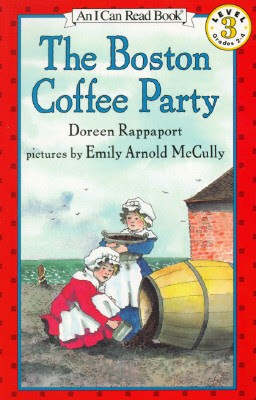 In 1990, Doreen Rappaport made the riot the subject of a charming children's book called The Boston Coffee Party. This was one of my very favorite books when I was in elementary school and I used it very successfully with my own second grade students. In fact, I recommend all of the books in this series, including Sam the Minute Man, George the Drummer Boy, and The Long Way to a New Land. When I taught second grade, we had to use scripted curricula in all subjects (it was a Title 1 district and a Reading First school), but I had a little bit of wiggle room to add supplementary lessons during the English Language Development block. I tried to devise history units that focused on the historical experiences of children, and these books were great. The vocabulary is simple enough that a seven-year-old can read it on his or her own, but the issues raised are meaty. The Boston Coffee Party is my favorite because food riots are near and dear to my heart and because the protagonists are girls. Nettie's Trip South: A young girl accompanies her journalist brother on a trip through the South just before the Civil War. There, she witnesses scenes of slavery and tries to understand them. The pictures in this book are black-and-white, so they may not grab the attention of all children. Be careful when reading this book with young children — I had several students cry during the slave auction scene. I liked starting discussions about slavery with this book rather than with a book about the Underground Railroad because it allowed students to build up some outrage before we start talking about resistance. Mary Anning: Fossil Hunter: This is English history, but this is a great book and can be used for either social studies or science. Mary Anning (1799-1847) was the English fossil hunter responsible for discovering several important plesiosaur fossils. There are several biographies of Anning, but I like this one best — the sentences are short and easy to read, the pictures are pretty good, and the author explains how members of the Royal Society published Anning's discoveries without giving her credit. One of my brightest students was so offended by this injustice that she wrote about Anning in her journal practically every week for the rest of the year and dressed up as Mary Anning the next Halloween. Tapenum's Day: These books, illustrated with photographs of living historians from Plimoth Plantation, were a smash hit in my classroom. The books follow three children through their typical days in Plimoth c. 1625. The lesson comparing our daily routines to theirs practically writes itself. We spent a whole week on these books (making charts, writing compare/contrast essays, etc.). Other teachers spent the week teaching their students "Ten Little Indians" complete with construction paper headdresses and hand-on-mouth war whooping (I'm not exaggerating). If you must do Thanksgiving, do it with these books and Molly's Pilgrim. Enjoyable reading, thanks. I’m always on the hunt for great children’s books and have recently discovered Bayard and their series of StoryBoxBooks, AdventureBoxBooks, DiscoveryBoxBooks They have work by acclaimed children’s books illustrator Helen Oxenbury appearing in the Storybox series for September. In addition to this, they also have some great activities for rainy days: http://www.storyboxbooks.com/potatoprinting.php, http://www.adventureboxbooks.com/macaroni-picture-frames.php, http://www.discoveryboxbooks.com/skittles.php Enjoy! The John Boyle diary is a manuscript in the collection of the Houghton Library at Harvard. I'm currently in the process of transcribing it (hopefully for some sort of publication). A partial version of the diary was published by the New England Historical and Genealogical Register in a series of pieces that ran from April, 1930 until April, 1931. This particular entry can be found on pg. 129 in the April, 1931 edition. I don't think that the NEHGR volumes are available online, but if you have a good public library or genealogical society, they may be able to get you copies. I've posted a few of Boyle's other entries elsewhere on this blog, which you are welcome to use (just search for "Boyle" in the box at the top left — I'm not sure I remembered to mark them all with appropriate labels). b. March 6, 1745/6 in Marblehead, MA. As a teenager, Boyle worked as a printer's apprentice for John Green, who published a newspaper called The Boston Post-Boy. After Green died, Boyle took over the business and eventually set up his own printing shop. Boyle kept a diary from 1759 (age 13) until 1778. Since he worked in the newspaper office, he had access to the news of the day and recorded the important goings-on in Boston (sometimes adding his own commentary). Boyle rarely wrote about his own life, but did record some interesting details, including his inoculation for smallpox in 1764. Boyle was a strong supporter of the Boston Whigs and gives extensive accounts of events such as the Stamp Act riots, Boston Massacre, Boston Tea Party, Lexington and Concord, etc. He died on November 18, 1819. I should have said that the title is "John Boyle's Journal of Occurrences in Boston."